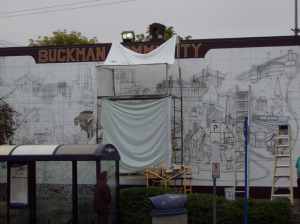 The Buckman mural exists on the south wall of the Plaid Pantry at Southeast 12th Avenue and Morrison Street in Portland. 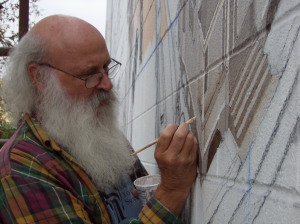 Created by local artist Joe Cotter (1949 - 2012), the 40-by-16-foot mural was funded by a $21,550 grant from the city's Bureau of Environmental Services due to the impact of the "Big Pipe" construction on the neighborhood. 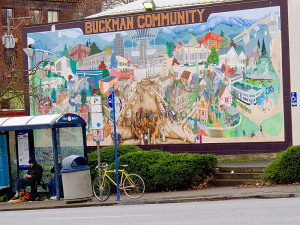 The "Big Pipe" is depicted on the mural, which also has an overall theme of sustainability — it shows community gardens (at Colonel Summers Park and Buckman Elementary), buildings with solar panels, and a guy outside his house harvesting rainwater. Cotter spent weeks walking the neighborhood block by block, taking hundreds of photographs. The composition of the Buckman mural is anchored on both ends by the Hawthorne and Burnside bridges. The Center of the mural depicts early Buckman in sepia tones and it transitions to full color as it moves outward in both time and space. The foreground depicts a variety of people walking, bicycling and conducting daily life activities in the present time. Some neighborhood landmarks to look for: Lone Fir Cemetery, Dr. Hawthorne's Insane Asylum, the chimney from the shuttered Washington High School, the hippo from Hippo Hardware, and lots of bicycles.